here is the Update from MPSC Board they are advt the MPSC Engineering Services Notification for all the MPSC Job Seekers on 03 April 2019 up ti 23 April 2019 the Maharashtra Assistant Engineer Online Application would be valid for the Sake of the Applicants. So, verify this portal to get the www.mpsc.gov.in recruitment online links before crossing the last date to send the MPSC Engineering Services Online form without feeling any difficulties. So, apply of these 1161 MPSC AE Vacancy that needs to fill by the very well being aspirants. After you check the MPSC AE Notification most of the seekers has the anxiety to know the specifications of the Maharastra Engineering Services Recruitment and let you in a clear way for getting the MPSC Assistant Engineer Online links that are already dispatched from this page. 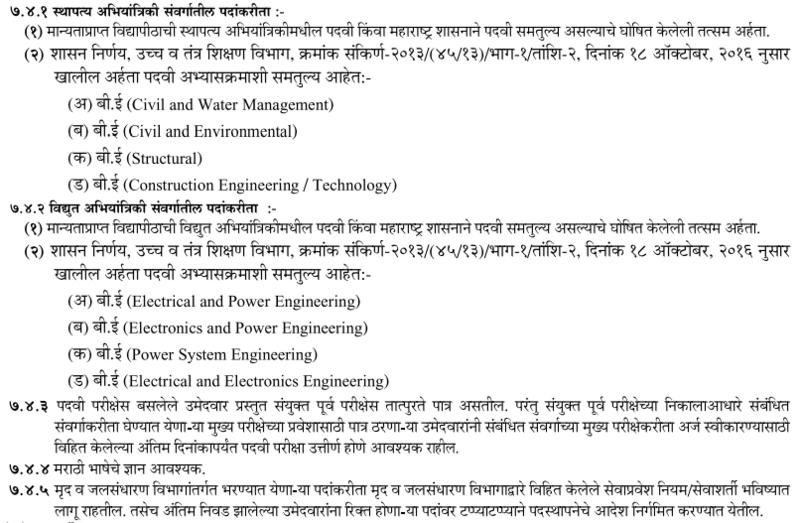 Maharashtra Public Service Commission has released the MPSC Engineering Services Recruitment by announcing the Latest Advt 05/2019 for selecting the Assistant Executive Engineer, Assistant Engineer, Sub-Divisional Water Conservation Officer & Water Conservation Officer Posts in the Maharastra PSC Officials Decision. So, fior this Cause the MPSC Board releasing the MPSC Engineering Services Notification on 03 April 2019. Now this will be happened till on 23 April 2019 So, you have the less time to get enrolled in this MPSC AE vacancy for the reason we are delivering the Post Wise Details and the Qualification Details to get partcipate to this Maharashtra Engineering Services vacancy for this Participation all the contenders need to know the educational Qualification, Age limit & the Vacancy Info that would be useful for submit the Maharashtra Engineering Services Online form before the deadline. So, dont forget to get the given available links that are already dispatched from this page. Till the Last date of MPSC AE Recruitment, the Applications are in the Active State. In this meanwhile, the competitors just know the Exam Syllabus in order to get well in all the topics. Once, the Aspirants may not have to gain the Details to apply this Maharashtra Assistant Executive Engineer Recruitment you may not have the idea how to start and end the MPSC Assistant Engineer Online form Submission Process. So, Given Detailed information is very important to know. So, the Partcipants that who are not very cleat about the MPSC Engineering Services 2019 Notification you can look down to get the Official Notification whcih is available in the Hindi language. The Maharastra AE Notification in Hindi is attached from this official page. So, read them and know if any details are mossed to give in this article. Almost the Details are we cover up ion this page. Still, you do not get the confirmation to take this Part as yo kn0ow them in a clear way. They should attain Degree in Civil Engineering/Civil and Water Management/ Civil and Environmental/ Structural/ Construction Engineering/ Technology/ Environment Science and Technology/ Electrical And Power/ Power System Engineering And EEE from recognized University. The selected contenders in the posts will get the basic pay of as per the norms per month. Additional benefits have been allowed in this post. Group-A Rs. 15,600- 39,100 and Grade Pay Rs. 5400 + other allowances. Group-B Rs. 9300- 34,800 and Grade Pay Rs. 4400 + other allowances. 19 years to 38 years old. Already some of the Participants are in the MPSC Engineering Services Online Application Submission Process. So, after reading out the MPSC Engineer Services Eligibility all of the Willing Candidates can engage in this MPSC Recruitment for AE, Assistant Executive Engineer Vacancy which is Officially declared in the Maharashtra Public Service Commission Board officials. So, the Maharastra Engineering Services Exam Dates are also updated from this page. keep in the note to appear for the exam & Know the Old Question Papers for the Purpose of getting the knowledge in the examination. After knowing the Maharastra Assistant engineer Vacancy is 1161 Posts need to take out from the Selection rounds. Som the APplicants make sure pf the given eligibility and then only submit the details to this MPSC Assistant Engineer Recruitment. MPSC Engineering Services Previous Papers DOWNLOAD NOW!! if of the details need to know to this Maharashtra Engineering Sevices online form links that are attachable through this page. Thr Maharashtra State is now intimating to the candidates to verify the Candidates behavior in the Recruitment selection rounds and provide them the marks those who are partcipate in the action to all of these conducting rounds. So, the Most eligible candidates only can apply to this MPSC Assistant Executive Engineer to all the departments like the Civil, Electrical & Architectural, Group- A & Group B Posts that need to get from the Official sites or else you just know the jobschat.in page. So, once a while, you can be verified through this page and know the required details before the closing date unless you are not committed to applying before the last date to this MPSC Assistant Engineer Application form you can not eligible to enter in this completae selection rounds.